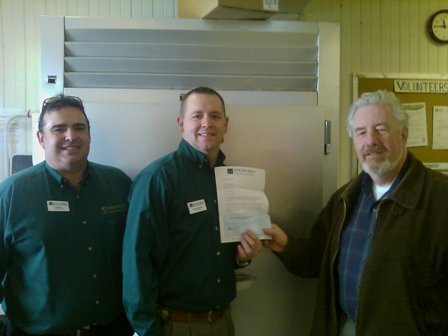 Photo Caption:Vincent Pasquale, Woodforest Bank; Ryan Anderson, Ohio Regional Manager; and Rev. Gordon Warner, Director of the Loaves & Fishes Food Pantry. CARROLLTON, Ohio (December, 2009) – Woodforest Charitable Foundation presents the Loaves & Fishes Food Pantry with a $250 donation. According to Policy Matters Ohio, over 2.8 million Ohioans, approximately 25 percent, do not earn enough to meet their basic needs. Woodforest Charitable Foundation’s recent contribution to the Loaves & Fishes Food Pantry will help support their mission of acquiring and redistributing food to those less fortunate. For more information about the Loaves & Fishes Food Pantry, please call (330) 627-3424. Celebrating 30 years of service and ranked among the top earning banks in the United States, the Woodforest family of banks currently has assets of approximately $3.2 billion and services more than 770,000 customers with branches in excess of 700 throughout fifteen states: Texas, Alabama, Illinois, Indiana, Kentucky, Louisiana, Maryland, Mississippi, New York, North Carolina, Ohio, Pennsylvania, South Carolina, Virginia and West Virginia. For information about Woodforest National Bank, please call 832-375-2000 or visit the bank’s website at www.woodforest.com.